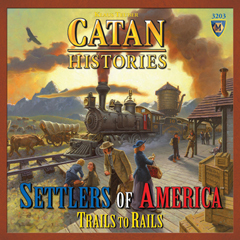 Settlers of America, Trails to Railsâ„¢ utilizes the simple, fun Catan hex-tile grid to map the young United States. Collect and trade resources in order to purchase and move settlers, build cities, lay rails and acquire and move trains. Create rail links to acquire gold, which lets you buy resources and use opponentsâ€™ rails. Use trains to distribute goods to rival cities. But, as your settlers populate the West, they deplete the resources of the East. Still, your options always abound. I am a huge fan of Settlers of Catan. I was excited when this game was announced and I was not disappointed when I first played it. The game has the same feel as Catan but really only shares a few of the mechanics from its parent game. There is enough new stuff in this game to make it a must have for Catan fans. I particularly like how you must balance your city building with delivery of goods. You must keep a balanced approach to your development. Great game and highly recommended. This game "trails" away from Catan's original game-play, but is refreshing and just as fun, although different. The point system, resources and the way things are built may have been altered but the award winning game-play is still there and still very addictive and fun. This is a good break from standard Catan games and on it's own a very good game as well. I have to say it's also one of the most well made, as most catan games are, boardgames on the market and fantastic fun to play!